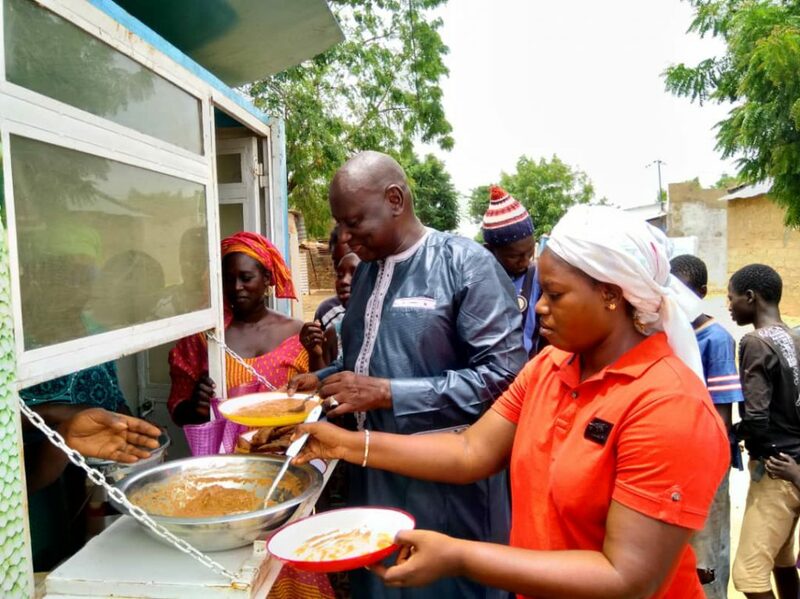 Thanks to a very engaged Mayor, Municipal Council and local community, Ndiob became the first city in Senegal to embark on an agroecological transition. After formulating a vision to become a green municipality through a process of economic and social development and welfare, inclusive and respectful for human rights, in particular towards vulnerable communities, in 2014 Ndiob established CAPCOMMUN – a Group of Friends and Partners. In 2017, a large community consultation took place, during which citizens from 18 villages across Ndiob formulated their Agriculture Development Programme. As a result, Ndiob invests nowadays a notable 23 per cent of its budget into developing agroecology, undertaking a series of appropriate and adequate measures to sustainably manage its natural resources and to achieve food security. With its community-based multi-stakeholder territorial approach and respect of the Future-Just Lawmaking Principles and Elements of Agroecology, Ndiob’s political strategies were recognized with an Honourable Mention of the Future Policy Award 2018, awarded by the World Future Council in partnership with FAO and IFOAM – Organics International. Ndiob’s Vision to become a green municipality triggered the establishment of CAPCOMMUN in 2014 and the formulation of the Agriculture Development Programme in 2017. The main aim is to initiate a process of biodiversity restoration and the implementation of agricultural production systems that ensure resilience, local self-subsistence and respect for the environment. Today Ndiob is promoting organic and agroecological agriculture and food production, processing and distribution in an impressive way, investing 23 per cent of its total budget in 2017-18, aiming to achieve food self-sufficiency. Ndiob also encourages and works with other mayors through the Network of Green Municipalities and Cities of Senegal (Réseau des Communes et Villes vertes du Sénégal, REVES). PRACAS Programme (Relance et Accélération de la Cadence de l’Agriculture), part of the Emerging Senegal Plan (Plan Sénégal Emergent). Investing EUR 42,000 or a notable 23 per cent of its 2017-2018 total budget into developing agroecology, Ndiob has undertaken a series of appropriate and adequate measures to sustainably manage its natural resources and to achieve food security, including by strengthening the skills of farmers for good control of good agricultural practices and the provision of quality seeds. For instance, it planted 7 ha of millet, with which it will achieve self-sufficiency in certified seeds (about 10 tonnes) in 2018, and it planted 300 ha of millet in ecological agriculture (about 450 tonnes), ensuring food self-sufficiency to 300 families. The target is that the Ndiop community will be self-sufficient in millet production by 2020. For these and other remarkable accomplishments, Ndiob’s political measures for agroecology were recognized with an Honourable Mention of the Future Policy Award 2018. Ndiob’s Agricultural Development Programme of 2017 was designed in a particularly inclusive way, with the people involved in all phases, from the diagnosis/analysis to implementation. The Programme includes one priority for each of the five regions: food security, management of natural resources, soil fertility, livestock breeding and farming and agriculture. Vision is to transfer community to agroecology. Use of compost, while fighting soil degradation and salination. Food production based on agriculture, animal/poultry breeding and use of local ponds. The programme has been developed based on community inputs. It is a good way to remove inequalities as it promotes jobs and an economic outlook. Women are participating, but still should be given more recognition. Agroecology is seen as an approach to protect human health, natural resources and ecosystems. Based on traditional, local knowledge, but there is also interest to integrate expertise from research insitutes, especially in the area of erosion protection. The programme has been developed directly with the involved communities. As it is a local programme, it is in principle very transparent. A lot of power and responsibility rests with the Mayor to realize the implementation. The programme is community-based; it is unclear whether it can be transferred from a local to a national level. Has been developed by the community for the community. A challenge is that it asks a lot of involvement by the communities in terms of participation, time and support, as the communities are poor and can only contribute in kind but not in cash. Sustainable development and protecting natural resources is explicitly mentioned in the National Development Plan and the Constitution of the Republic of Senegal. Since 2014, the Government undertook a series of reforms (policies concerning pastureland, forests, land, decentralisation, etc.). Thanks to the General Code of Local Entities, mayors received significant authority regarding land and environment management. This makes the mayors also responsible to take a leading role in protecting natural resources, biodiversity and sustainable development. Agroecology in this context is one of the main options to counter soil degradation, improve climate resilience and increase harvests. Ndiob is a rural community, with an official estimated population of approx. 20,000 in 2018, with a surface of 127 km2, in the district of Diakhao, approx. 160 km east of Dakar, Senegal. Ndiob’s population is mainly composed of the ethnic group of the Serers, which is the third largest ethnic group in Senegal making up 15 % of the Senegalese population, who mainly have been farmers and landowners, and are known for their mixed-farming. For the Serers, the soil (where their ancestors lay in rest) is very important and they have a legal framework governing every aspect of life, including a land law with strict guidelines. About 50 years ago, the town of Ndiob was self-sufficient for food supply. Harvests were abundant and the fauna and flora of remarkable richness. Fruits and milk were not marketed at that time. Due to considerable deterioration of the socio-economic situation, nowadays things have turned negatively. However, thanks to Senegal’s ongoing decentralization processes, the municipality has now more autonomy for land and natural resources management, which, if managed wisely, can provide food security and economic prosperity. Ndiob is the first municipality that launched the territorial approach to rural development in Senegal. In June 2014, a new municipal council had been installed, which formally defined and adopted its vision “to make Ndiob a green municipality, resilient through a process of economic and social development and welfare, inclusive and respectful for human rights, in particular towards vulnerable communities.” This orientation had been already defined by the municipal members during the election campaign and had then been also endorsed by the Green Party of Senegal. To implement its vision, the municipality – led by a very engaged Mayor – was supported by the NGO ENDA Pronat that is promoting agroecology in West Africa. ENDA Pronat conducted a participatory analysis of community needs involving more than 1,000 local people and actors (50 percent were women). It carried out an evaluation of production systems and developed an Agricultural Development Programme, which was understood and accepted by the local community. In response to the major problem of environmental degradation as a result of outdated cultivation methods and climate change (i.e. disappearance of pools, forests, pastures, decline of soil fertility, etc. ), local people demanded better natural resources management and capacity-building to support the agroecological transition. In July 2017, the results of this analysis and the Agricultural Development Programme were presented to the whole community in presence of about 400 persons from all 18 villages of Ndiob as well as further partners such as the FAO, World Vision, National Agency for Agricultural and Rural Council (ANCAR) and University Cheikh Anta Diop of Dakar (UCAD), who pledged to support certain aspects of this initiative. Moreover, during a meeting in 2016 organized by the NGO ENDA Pronat, the Network of Green Municipalities and Cities of Senegal (REVES) was founded, which is currently presided by the Mayor of Ndiob, Mr Oumar Bâ. The main aim of Ndiob is to initiate a process of biodiversity restoration and the implementation of agricultural production systems that ensure resilience, local self-subsistence and respect for the environment. Ndiob’s wishes to thereby contribute to the development of territorial policies based on the principles of agroecology and good governance of natural resources. Responsible for the policies are the Mayor and Municipal Council of Ndiob with input from the local communities. They are implemented through the municipality, with support of strategic partners such as ENDA PRONAT, and in cooperation with the Collective of Friends and Partners of the Community of Ndiob (CAPCOMMUN). CAPCOMMUN shares the vision of the municipality and serves as a forum for consultation, exchange and multi-stakeholder action. Among the partners are Institut de Recherche Agricole (ISRA), Agence National de Conseil Agricole (ANCAR), Service Régional de l’agriculture, ENDA PRONAT, CLUSA, WORLD VISION, Coopérative des Agriculteurs (set up by Ndiob), University of Cheikh Anta Diop. To implement its vision of “making Ndiob a green, resilient municipality, through an endogenous, inclusive and respectful process of development of the rights of vulnerable people”, the Ndiob Municipal Council has set itself a certain number of objectives both in terms of self-sufficiency in certified seed and production for sale of cereals and peanuts seeds which are the main cash crop of the municipality. Ndiob’s minimum goal is to produce the village’s annual consumption of 3,650 tonnes of millet and to plant peanuts on 2,500 ha to be sold as certified seeds on markets and thereby create cash revenues. It selected 84 seed breeders, each one planting one hectare for breeding stock. Each of these producers has received from Ndiob municipality and from CAPCOMMUN partners seeds and reinforcements in technical capacities. Strengthening of local governance (includes establishment of a local charter and of a surveillance committee as well as drawing maps of the area and plot delineations). Local bank for savings and micro-credits to support local agriculture, livestock and poultry breeding as well as the use of the ponds. In 2017-2018, Ndiob’s budget for agroecology and sustainable development is EUR 42,000. This corresponds to 23 per cent of Ndiob’s total budget, a massive investment compared to the 2 per cent recommended by the REVES Charter agreed in 2017. Among the most costly measures are: EUR 1,830 to support seed production; EUR 1,200 invested in the training of 600 producers in agroecological practices; EUR 3,050 to build the capacity of farmers on agroecological practices; EUR 9,150 to distribute 200 ewes to poor households to promote the breeding of small ruminants; EUR 7,620 into the establishment of a credit fund financing agricultural and processing projects for young people and women; EUR 1,600 for the distribution of 23 millet mills; EUR 10,600 for connecting 300 households to water supply; and EUR 3,800 to help establish a water desalination unit. In terms of its objectives to achieve self-sufficiency in certified seeds and production of millet and peanuts, Ndiob worked extensively with its CAPCOMMUN partners. Regarding millet, Ndiob will achieve this year self-sufficiency in certified seeds (about 10 tonnes). It is already planting 300 ha of millet using ecological agriculture this year, with an estimated production of 450 tonnes, ensuring food self-sufficiency for 300 families. In terms of peanuts, the collected 84 tonnes of seeds will be used on 560 ha. By 2020, Ndiob plans to achieve self-sufficiency in certified peanut seeds (375 tonnes per year). Each of the farmers has earned more than EUR 530 of income each in just one season. Moreover, Ndiob’s multifunctional farmers’ cooperative has been approved as a seed producer by the Ministry of Agriculture. In 2018, two villages – Thiallé and Soumnane – of Ndiob decided to adopt agro-ecology as a way of life in different areas. They will be pilot villages and accompanied by the municipality and its partners such as FAO, INP and Elephant Vert. The aim is to build on the results and gained experiences of these two villages to further multiply activities to other villages of the municipality. Moreover, Ndiob’s Mayor is chairing the Network of Green Municipalities and Cities of Senegal (REVES): Some 30 mayors attended its first constitutive meeting held in Ndiob in January 2017, where they adopted a Charter of Green Municipalities and Cities of Senegal with which they committed “to design and implement local environmental development plans and to devote at least 2 % of our budgets to environmental education and environmental projects”. Subsequently, REVES has developed an action plan (Declaration of Mékhé) that resulted in: 1. Capacity-building activities for mayors on agroecology and biosecurity (GMOs), e.g. two workshops were organised in 2017 with the technical support of ENDA PRONAT in the communities of Mékhé and Dramé Escale, and 2. Implementation of the agro-ecological vision of rural development in a few pilot municipalities, including that of the Mayor of Ndiob (Thiallé and Soumnane). Ndiob inspired other communities to join REVES which has become a platform for exchange of experience and methods. Today, the network has around 40 members who are inspired by the strategy of Ndiob. REVES is also a privileged partner of ENDA PRONAT. In 2018, the REVES co-organized with ENDA PRONAT, the National Federation of Organic Agriculture (FENAB) and the UCAD the 2nd edition of the Agroecology Days in February 2018 at the Place du Souvenir Africain in Dakar. These days were closed by the “Night of Agro-ecology” at the Daniel Sorano Theater, with a live broadcast of the debates at 2STV, sponsored by the Minister of Livestock and Animal Production Aminata Mbengue Ndiaye and attended by more than 1,500 people (parliamentarians, members of the Economic and Social Economic Council, researchers, civil society organizations, farmers’ organisations). In an interview the Minister of Agriculture confirmed the Government’s interest in promoting agro-ecology, an essential lever for sustainable development of the sector from a safety perspective. Ndiob’s achievements inspire others to follow its example and through REVES, which Ndiob currently presides, the municipality is networking and exchanging experiences and methods with 40 other green and ecological communities and cities in Senegal. Its approach is culturally adapted to the way of life in West Africa and many elements could be replicated in other countries of that region. Ndiob became the first city in Senegal to embark on an agroecological transition. Designed in a large community consultation, citizens from Ndiob formulated their Agriculture Development Programme, which includes five priorities: food security, management of natural resources, soil fertility, livestock breeding and farming, and agriculture.